Colored postcard image of the front of the historic Park Place Hotel, the ten story structure pictured here was completed in 1930. Creator has taken liberties with the location of the streets surrounding the hotel. "Natural Color Post Card Made in U.S.A by E.C. Kropp Co., Milwaukee, Wis.-CCL". 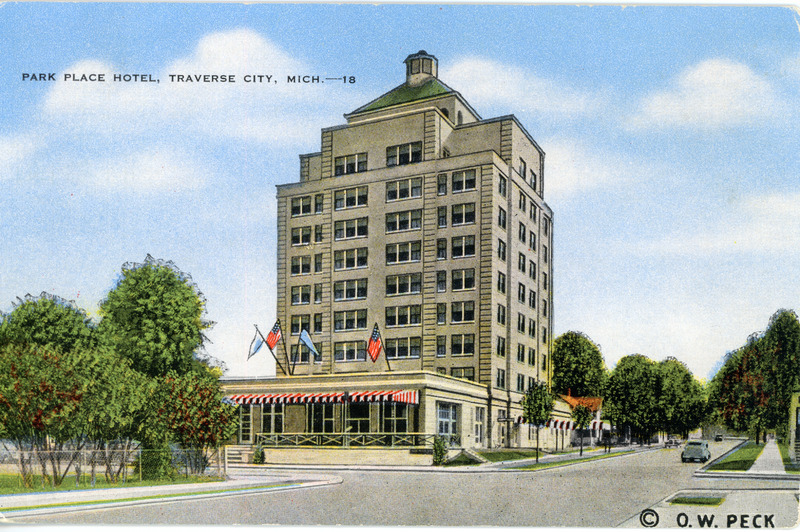 Orson W. Peck, Traverse City, Mich., “Park Place Hotel, ca. 1930,” TADL Local History Collection, accessed April 21, 2019, https://localhistory.tadl.org/items/show/1973.